Skeena Meadows Wildlife Preserve is a breathtaking 685 acre property uniquely situated on the banks of the world famous Skeena River, in British Columbia, Canada. The Skeena is British Columbia’s second largest river and one of the most important salmon and steelhead rivers in the world. Featuring 4 kilometres of riverfront, Skeena Meadows is nestled in a valley and bordered on one side by this world-class river and surrounded by spectacular mountain views and wildlife. The property encompasses a wide diversity of environments including large growth forest, fields, grasslands, natural meadows and wooded hillsides. A year-round salmon spawning stream which is also home to Cutthroat, Dolly Varden, Rainbow Trout and Coho flows through the property, bringing added enjoyment and beauty. As a pheasant preserve, Skeena Meadow’s varied fields, meadows and grasslands are well-populated with birds, and they are one of the only pheasant shooting preserves in all of northern British Columbia. In addition, migratory geese visit the property for several weeks in the fall, and the local area also sports a strong grouse population. Wildlife is also abundant, as moose, bear, white tail and mule deer inhabit the property and are regularly seen. 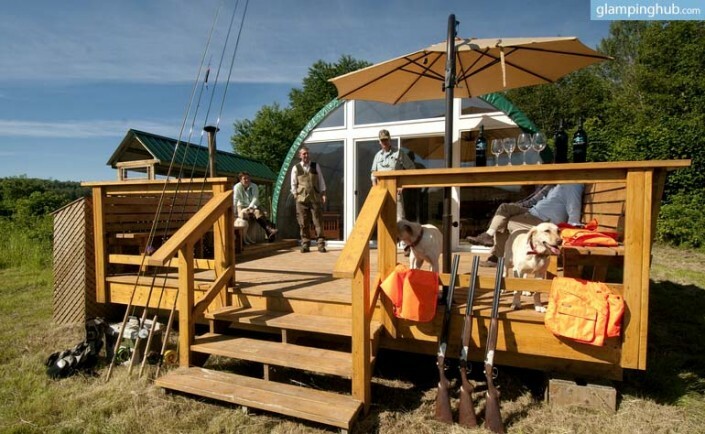 For discerning anglers, bird shooters and outdoor enthusiasts, Skeena Meadows offers unlimited potential for sport, recreation and exploration in a private, secluded and stunning setting. The legendary salmon and steelhead runs of the world famous Skeena are literally at your doorstep. Access to 4 kilometres of fishable water is available on the private property, with an additional 5 kilometres of adjoining public land also at your disposal. All the runs are easily reached with the provided ATVs. A boat launch is also available free of charge to the guests who wish to bring their own boats. They do not provide guided fishing, but should you wish to hire a guide, there are several fully qualified and licensed guides in the area who They can recommend. Rates and availability are subject to each individual guide. Combining the appeal of sleeping in the outdoors with the creature comforts of a fine hotel stay, the lodging at Skeena Meadows re-defines the notion of “camping”. Each of the four 864 sq.ft. 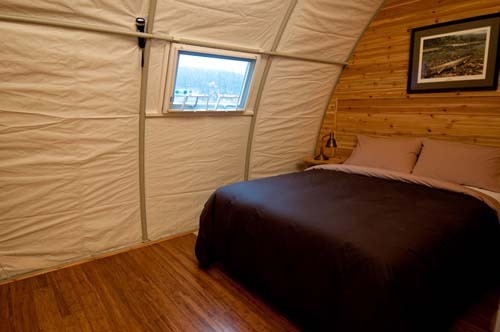 “tents” are insulated, smoke-free, and feature hardwood floors, leather furniture, fine linens, propane heaters, remote start generators, showers and full kitchen facilities. Situated in secluded and private settings, each spacious tent also features two outdoor decks and a wood-fired hot tub. Daily housekeeping services and an expediting service for anything you may desire are also provided. 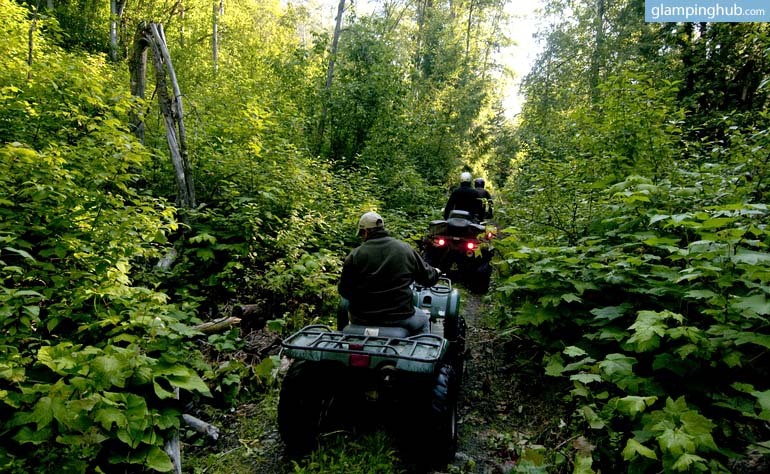 Also included with each tent is a covered, 4×4, side by side ATV for your personal and exclusive use which allows you free-range of the property, whether to access fishing runs, shooting areas, or to simply explore the terrain. The use of personal vehicles is minimized to maintain the integrity of the environment, and to preserve the outdoor experience. During your stay at Skeena Meadows, you call the shots for the meals and times which suit your schedule the best. You are free to bring your own provisions, or they can provide an exquisite choice of entrees on a daily basis. Breakfast and lunches can be ready to go in the fridge and dinners will be prepped as much as possible and delivered to you. You just need to follow the simple final instructions and enjoy a decadent meal at the time you choose. Whenever possible, they strive to provide garden fresh vegetables in your personal pantry which are grown right on the property, or purchased from local producers. Along with the fully appointed kitchen, each tent is also furnished with a BBQ for outdoor grilling. Combined with the daily housekeeping service, the food service leaves you feeling like you have been on that special vacation. Skeena Meadows’ food is as unique as the accommodation. There are no set meal times as you decide when to cook. The exquisite table fare is delivered to your tent daily with full instructions on how to cook it at your convenience. If the fishing is hot until 9pm, keep going! There’s no reason to stop for pre-arranged dinner times. Each day, the housekeeping staff will replenish your stock items, clean up and do your dishes so all you have to worry about is enjoying your time in the outdoors. The following are examples of the type of fare offered at Skeena Meadows. Smoked Salmon Canapés – Smoked Salmon atop a Pumpernickel & Bagel Canapé with Dilled Crème Fresh, Red Onion and Capers. Wild Mushroom Pate – With Oven Roasted Crostini’s and Port Jelly. Jumbo Garlic Prawn Cocktail – Garlic Butter Poached Colossal Shrimp Accompanied with Skeena Meadows House made Cocktail Sauce. Barbeque Brie Platter – Brie topped with Seasonal Fruit Compote Packaged in a Banana Leaf to be Warmed on the BBQ. 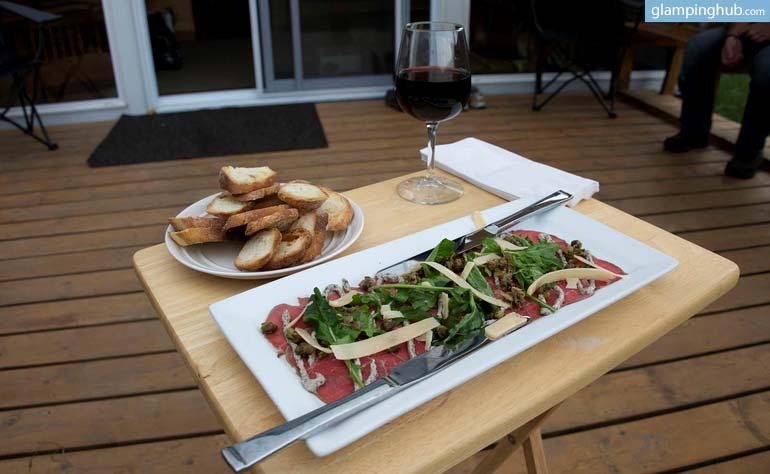 Hazelton Farm Beef Carpaccio – Served with First Cold Pressed Extra Virgin Olive Oil, Tellicherry Black Pepper, Shaved Regiano Parmesan Cheese and Toasted Artisan Baguette. Or Bone in Prime Rib steak – 10 oz. 21 Day Aged Grass Fed Rib Eye Steak served with Pan Gravy and Yorkshire Pudding. Peak Season (August, September, October): $360 per person / per night. Based on double occupancy. Regular Season (July & November): $300 per person / per night. Based on double occupancy.